(CNN) -- A purported audio message from Al Qaeda's second-in-command appeared on radical Islamist Web sites on Sunday eulogizing Baitullah Mehsud, the former leader of the Pakistani Taliban. 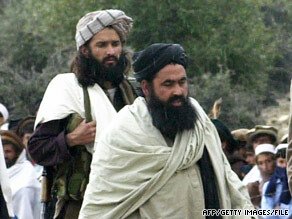 Baitullah Mehsud, right, and a bodyguard in Pakistan in 2004. "Baitullah managed to create a massive Jihadi movement that launched wars, ambushes and battles against the crusaders and their agents in Afghanistan," said the speaker, identified as Ayman al-Zawahiri. "He also managed to clearly show that the Pakistani government is not Islamic but instead an infidel treacherous government working as a servant to the crusaders." The praise of Mehsud came nearly two months after his death in August. The militant group had previously acknowledged his death. CNN obtained the 28-minute message from IntelCenter, a think tank that specializes in tracking terror groups. A still picture over the audio showed al-Zawahiri dressed in white and seated in front of bookshelves. CNN could not independently verify the authenticity of the message. "To the Americans I say, you killed Mehsud, but you will not kill Islam or the Jihad," the speaker said. "Islam doesn't end by the death of one man." Reports from the region suggest government troops have dislodged the Taliban from many areas of Pakistan's North West Frontier Province, but militant attacks continue daily. NATO-led forces are battling the Taliban across the border in Afghanistan as well. U.S. and British forces launched offensives in Helmand province over the summer. "Jihad will go on until the liberation of Afghanistan and until you run away defeated from our land," the speaker warned. "The global peace and security will not be achieved unless you withdraw from the lands of the Muslims."